Judge Charles W. Froessel would reach the constitutional age limit of 70 years at the end of the year. The Democratic state convention met from September 16 to 18 at Syracuse, New York, and nominated U.S. Attorney for the Southern District of New York Robert M. Morgenthau for Governor on the second ballot. They also nominated Mayor of Binghamton John J. Burns for Lieutenant Governor; Manhattan Borough President Edward R. Dudley for Attorney General; James B. Donovan for the U.S. Senate; and re-nominated the incumbent Comptroller Arthur Levitt. 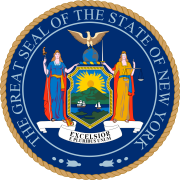 The Republican state convention met on September 19 at Buffalo, New York, and renominated the incumbents Rockefeller, Wilson, Lefkowitz and javits; and completed the ticket with John P. Lomenzo for Comptroller and New York Supreme Court Justice Marcus G. Christ for the Court of Appeals. The Liberal Party met on September 19, and endorsed the Democratic ticket. The Socialist Workers Party nominated a full slate, and filed a petition to nominate candidates. The Conservative Party selected on July 13 David H. Jaquith to run for Governor. They filed a petition to nominate candidates which was challenged by the Republicans. On October 1, the Republican State Chairman L. Judson Morhouse announced that his party dropped the suit, and the ticket went on the ballot. This page was last edited on 10 January 2019, at 20:34 (UTC).